I discovered this recipe the other day and got a big thumbs up. Be rude not to share! 1. Place the jelly cubes in a jug & add 100ml lemonade and place in microwave for 1 minute. 2. Stir well until dissolved. 3. 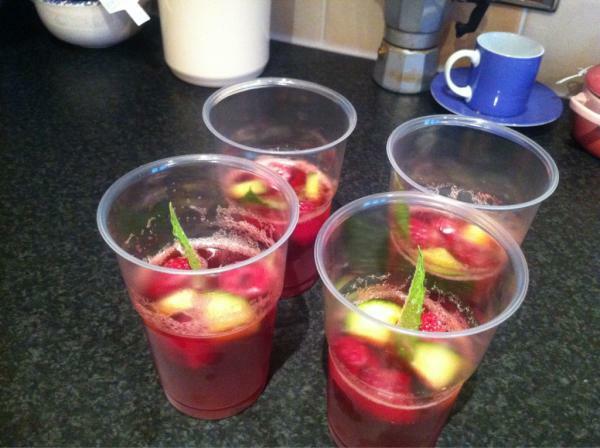 Add 2-3 shot glasses of Pimm’s, depending on how strong you fancy it. 4. Fill the jug up to 1 pint with lemonade and stir. 5. Pour into 4 glasses – I use plastic cups so I could take them on a picnic. 6. Add 3 raspberries per cup. 7. Slice your strawberries and add to each cup. 8. Add a few chunks of cucumber and a sprig of mint. 9. Pop in the fridge to set for a few hours. 10. Hey presto you’ve got Pimm’s jelly – best served with sunshine!